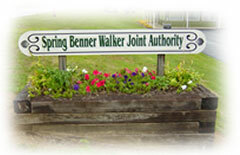 The Spring Benner Walker Joint Authority was first incorporated by the Spring Township Supervisors in April 26, 1966 for the purpose of providing and extending the sanitary sewage service to portions of Spring Township, Centre County, Pennsylvania. Over the years, the scope of the system broadened and it became necessary to service portions of Benner Township, Centre County, Pennsylvania. Early in 1983, Walker Township was incorporated into the system, forming what is now the Spring-Benner-Walker Joint Authority (SBWJA). Since this time the Authority has grown and currently provides sanitary sewer services to approximately 30,000 people in six different municipalities within Centre County covering over twelve square miles. The Authority provides sewer service to the University Park Airport, two State Prisons at SCI Rockview and SCI Benner, as well as the Centre County Correctional Facility for a combined housing of more than 5,000 inmates. There are also three industrial parks connected within the system’s 150 miles of gravity sewer mains. Due to the topography, 18 pumping stations and 75 individual grinder units are used to convey flows through more than 30 miles of pressurized force mains. There are twelve dedicated employees that help maintain the system and ensure the community’s investment in infrastructure is diligently maintained. The system customers enjoy one of the lowest rates for sewer service within Centre County and the very low wet weather flow ratio of the system is an example of the hard work of the Authority staff. The SBWJA also operates, maintains and administers the Benner Township Water Authority providing public water service to 350 customers within Benner Township. Please take a minute to browse through our site and if you have any questions please contact our office.